Today, we continue my chronological exploration through my personal top ten movies of all time. The movie this week is probably the least well known of my whole list and also the smallest in scope. 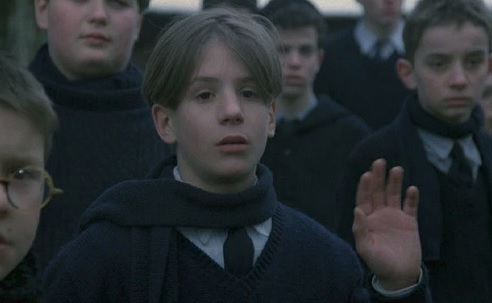 It is Louis Malle's 1987 film, Au Revoir Les Enfants. Louis Malle is an interesting director. He never gained a huge following, and his best known movie is probably My Dinner with Andre (which I actually have never seen), but everything he made is eminently watchable. The most recent movie of his that I was exposed to was Vanya on 42nd Street, a performance of Chekov's Uncle Vanya presented as a rehearsal in a dilapidated theater. That film did more to enhance my opinion about the importance of actors than any other movie I've ever seen. 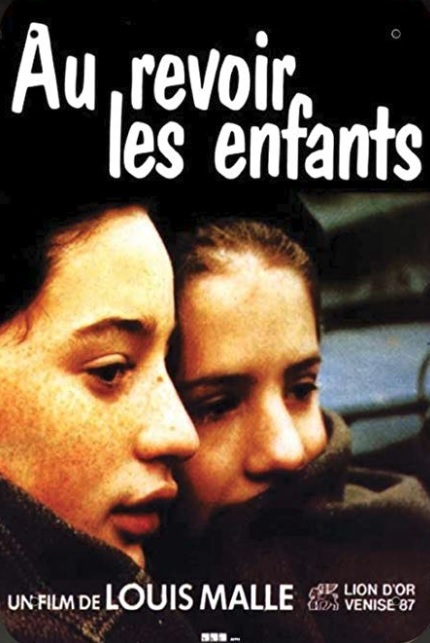 Au Revoir Les Enfants is deceptively simple. It's the story of two boys in a Catholic boarding school outside of Paris during World War II. The main character, Julien, like the rest of the boys at the school, is the son of wealthy parents. Like most eleven year old boys, he has little understanding of the world outside his childish concerns. At one point he asks his older brother, who also goes to the same school, what a Yid is. Julien Quentin: I know, but what exactly is a Jew? François Quentin: Someone who doesn't eat pork. Julien Quentin: Are you kidding me? François Quentin: Not at all. Julien Quentin: What have people got against them? François Quentin: The fact they're smarter than us, and they crucified Jesus. Julien Quentin: That's not true. It was the Romans. Is that why they have to wear yellow stars? This lack of understanding of the greater world around him mostly seems to confuse little Julien. As far as he knows, he's never met a Jew, but he does see them from time to time. There's an old man in a restaurant who gets threatened by Vichy French militia. There's a younger Jew who walks out of the public bath (which Jews are barred from entering in the first place). This inability to grasp the implications of anti-Semitism is made all the more potent with the addition of a new boy to the school: Jean Bonnett. He's obviously not like the other kids. He doesn't pray the Hail Mary with everyone else. He doesn't take communion. He doesn't even take Greek (because of his knowledge of Latin). Jean doesn't really notice Julien, he's just another one of the boys that picks on him for his last name ("Easter Bonnet" they call him), but the two begin a relationship that steadily grows as the film progresses. The relationship that develops between Julien and Jean feels shockingly real to me. It doesn't have a linear path. Instead, it ebbs and flows between moments and events that they both enjoy and small fights that erupt between them. With each moment they share, the two grow closer in the way that boys who fight often do. Whenever I hear actors talk about finding truth in their performances, I tend to roll my eyes. I find it pretentious talk, but I'm going to engage in some of that very same stuff now. Everything about this movie feels so very true, starting with the two boys themselves. Acting very understatedly and believably by two young performers (Gaspard Manesse and Raphael Fejto) who almost never acted again, everything the two do and say feels genuine. The reading at night, the insults they hurl at each other, the way they avoid hiding away during an air raid just to play on a piano without any real rhyme or reason. All of it feels completely natural and believable. That believability about every little thing in the actors' performances really sells the reality of the movie as a whole. That believability doesn't end with just the performances. The movie was made in a small boarding school called the Institution Sainte-Croix outside of Paris. It was filmed entirely in winter so that when the boys complain of cold, it very well could be because they were actually really cold. I talked before about Julien's inability to understand the world around him. That attitude is very much not reflected in Jean, for Jean's secret is that he's a Jew on the run. 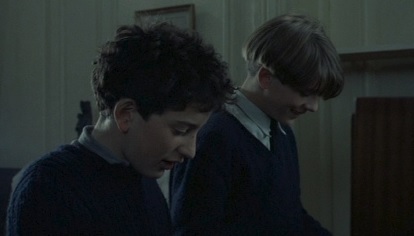 The priests and teachers of the school have taken in three Jewish boys in an effort to hide them from the authorities. Julien has trouble connecting with people easily partially because he's so terrified that an errant word on his part, or on the part of another boy, could give away not only himself but the two others. There's a great moment in the latter half of the movie that highlights the difference in how Julien and Jean approach the world. All of the boys in the school have been sent out as two separate team to find a treasure. Julien gets separated from his team but finds the treasure on his own. Alone with night approaching, he looks around and finds Jean nearby. Julien's mind is on play. Jean's is on the danger that surrounds him at all times. How does Julien combine his innocence of the world with Jean's fear that never goes away ("You scared?" Julien asks, "All the time," Jean replies)? He can't quite do it. He's no mature enough to understand. Through circumstance, Julien discovers that Jean's real last name is not Bonnett but Kippelstein, and in a fit of momentary rage threatens to tell everyone Jean's real last name. He has no idea of the implications of what that would entail. There's a subplot in the film about a cook's assistant who trades with the boys for their foods that their parents send them from home. Julien's mother gives him jam, so Julien trades with the cook's assistant for little things here and there in exchange. When the head of the school finds out that the cook's assistant not only was trading with the boys, but was helping to supply the black market from the school's kitchens, he's furious and fires the assistant. The assistant (Joseph) finds the act unjust, especially since the cook herself, according to him, did it just as much as he did, if not more. With nowhere to turn, Joseph turns informant based on the obvious suspicions around the three new boys (who never ate pork). Bonnet, Negus and Dupre died at Auschwitz; Father Jean at Mauthausen. The school reopened its doors in October. More than 40 years have passed, but I'll remember every second of that January morning until the day I die. The impressive emotional impact of the film itself combined with the fact that it's autobiographical to the film's director. This film is so small in scope but affects me so intently that I treasure the fact that I saw it right around the period that I was originally developing my top ten years back.